I’d be impressed with anyone who ate all of the twenty-nine different burgers being offered for Van Foodster’s Best Burger Challenge. It is doable and I can’t deny that every burger has something intriguing about it that makes me want to try it, but that’s more than a burger a day! With the variety of creations, at least you wouldn’t be bored. 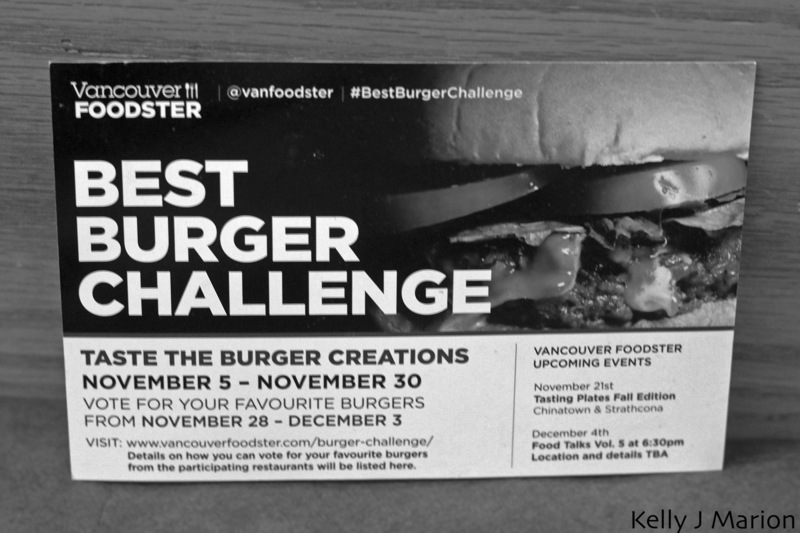 Vancouver Chefs were eager to partake in this challenge, assuming that the burger on their regular menu is already the best or wanting to test their creative culinary skills. There is something for everyone, from Dundarave’s Ocean Wise Halibut Burger and Fish Cafe‘s Blackened Salmon Burger Extraordinaire to Ace’s Coffee Rub Burger and Tap & Barrel’s PB&J Burger. If you’re a fan of EPIC MEAL TIME check out Catch 122‘s bacon wrapped sirloin patty. If you love Vietnamese subs try Chef Simon McNeil’s Pork and Shrimp Banh Mi Burger at Dockside Restaurant. And if all you really want to do is see how wide you can open your mouth try Society‘s massive and messy Meat Sweats Burger with an onion ring, pulled pork, bacon and a fried egg atop a prime rib beef burger. The sky is the limit when it comes to these burgers as there were no constraints given to the chefs. The Rumpus Room even did a Breakfast Waffle Burger! With less than a week left you still have the opportunity to get your hands messy and dig in to some of these burgers whether you crave a jumble of ingredients together or like to keep it classic. I went on a mini media tour where we sampled the creations of Chef Travis Redpath of Max’s Burger, Chef Megan Martin of Luke’s Corner Bar and Kitchen and Chef Peter Gray of Whet Kitchen and Bar. 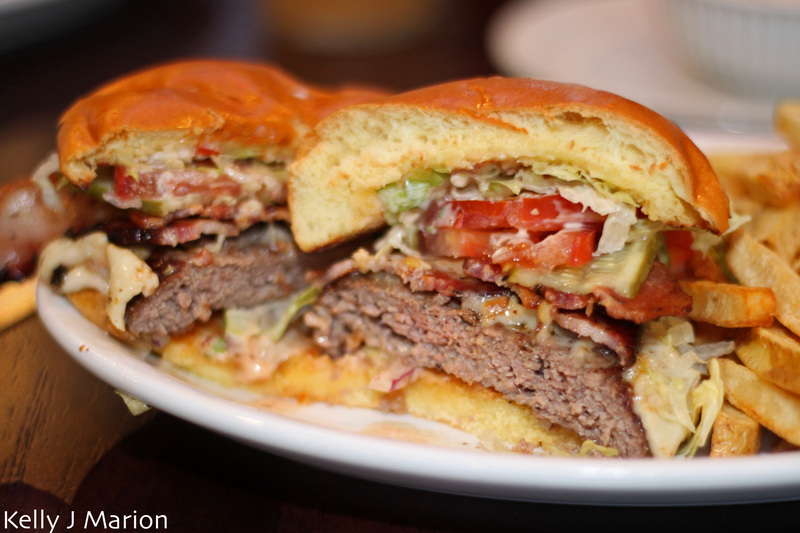 This burger has your standard ingredients: cheese, bacon, iceberg lettuce, tomato, red onion and a pickle. But are they really that standard? The 5 1/3 ounce beef burger patty is sourced from grass-fed and grass-finished cows and made in to a patty that is dry-aged for thirty-five days. Due to the high-quality meat they choose to season it simply with only salt and pepper. No Montreal Steak Spice or dried garlic for these guys. The meat is complemented with a flavorful Armstrong semi-soft Amber Ale cheese and two slices of herb-crusted smoked bacon. Without these two ingredients it wouldn’t have had the wow-factor that it warranted. They didn’t skimp out on either and a had a bite of bacon in every bit that I took. Cooked crisp but still flexible this was some delicious bacon. Throw all that into their fresh onsite-baked brioche bun smothered with their signature Big Max sauce and top it with shredded iceberg, two slices of tomato, red onion and a pickle and you’ve got yourself a scrumptious burger. Thor Diakow and Joe Leary seemed to enjoy it so much that they devoured the whole burger, knowing very well that they had two more burgers to taste afterwards. I was tempted. The side of freshly chipped french fries cooked in beef tallow were cooked perfectly and super addicting with the truffle mayo. And I’m not a fry person. Local ingredients were the focus of this burger, obvious by their beef supplied by the Honest Butcher, their cheese from The Village Cheese company, their bacon from Woodland Smokehouse sourced from Gelderman farms in Abbotsford and their BC Kennebec fries. Bartender, Marc Smolinski, whipped up a Pomme De Terroir to go with Trevor’s burger. This was a seasonal variation of the whisky sour with roasted gala apple puree, bosc pear shrub (drinking vinegar), local bitters, Canadian whisky and R & B Brewing Raven Cream Ale. The dried apple garnish was a nice touch to the refreshing beverage. Luke’s focuses on New American cuisine & Southern hospitality, striving to be your friendly neighborhood restaurant while also bringing an upscale dining experience. Chef Megan Martin spent two months creating the only vegetarian burger in the Best Burger Challenge. She claims that “anyone can make a great hamburger but to balance the texture, taste, consistency and “cook-ability” of a great veggie burger requires patience and skill.” With this bold statement in mind, I was expecting something that would blow me away. I wasn’t let down by her burger, finding it to be a very well done meatless patty. As a very carnivorous person though, I would rarely choose even a delicious veggie patty over a meat patty, whether bison, elk, beef or pork. Megan’s Southern Veggie Burger is composed of quinoa, toasted almonds, black beans, panko bread crumbs, egg, Parmesan, garlic, onion and spices. While blending these ingredients together to form the patty, she also leaves some whole so that as you bite in to the burger you are able to taste the individual items as you’re eating it. This is her way of keeping it pure while having multiple ingredients. I appreciated this notion as sometimes when chowing down on veggie burgers it really is hard to tell what it is made of. The burger is topped with wild mushrooms, BC White Cheddar, caramelized onions and beer battered dill pickles and jalapeno peppers as well as an in-house made granny smith chipotle ketchup. The caramelized onions were a nice touch to the burger adding a touch of sweetness to the spice coming from the chipotle in the ketchup and the jalapeno peppers. Although not for everyone, I really liked the beer-battered pickles and jalapeno peppers on the burger for the crunch and the heat they added. The bun was nice but because their was not a lot of moisture in the patty due to lack of fat sourced by meat, I preferred it open-faced. The burger was served with some tasty beer-battered pickles and jalapeno peppers as well as yam fries with house-made sauces. A 7oz patty? Now that’s my kind of burger. The smell of this burger enveloped the entire restaurant as the spice-filled patty sizzled on the grill. In their house made 7oz AAA Alberta Beef patty patty is oregano, cumin, garlic, grainy dijon mustard and eggs. I loved that you could see the mustard seeds in the meat as I’m a big fan of whole grain mustard and it’s unusual that you see it in a patty. I felt that it was a tad over-cooked though and was a bit on the dry side. While the beef isn’t locally sourced (yet), they use buns that are made specifically for them by their neighbour, La Baguette et l’Echalote. “This is something we’re trying to focus on, who in our own community and our own neighbourhood can we pair with? For example, I have a cheese plate on our new menu that uses cheese from Benton Brothers,” mentioned Chef Peter Gray as he explained his dish. Unfortunately the buns were also on the dry side and didn’t seem like they were made fresh that day. I was surprised because I’ve had bread from La Baguette before and it has always been fantastic. 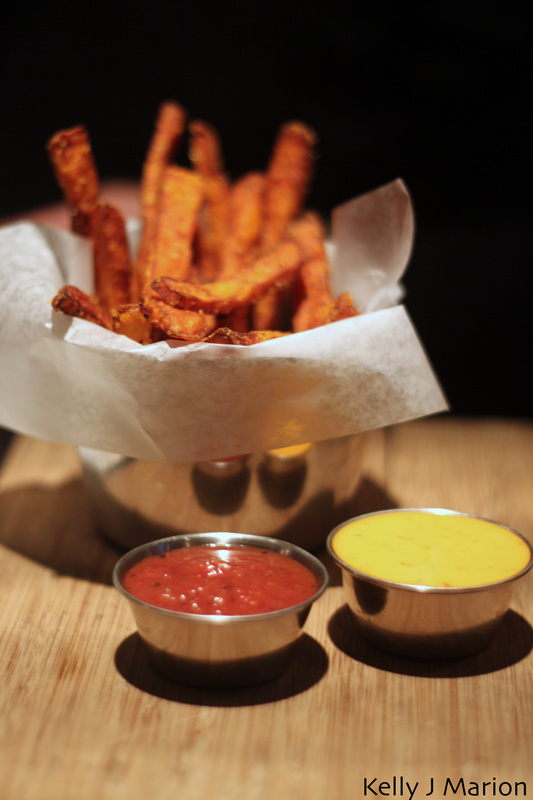 To aid a dry burger, condiments and toppings always help. Peter’s relish is a combination of red bell peppers, onions, mustard seeds, balsamic vinegar, red wine and fresh tarragon and in the past has been used with many other proteins but this is the first for beef. It was tangy, chunky and complemented the beef well. On top of the burger sat aged white cheddar, Alder wood smoked bacon, red vine tomatoes, and romaine lettuce. I loved the bacon that had that sweet and smoky essence from the Alder that paired well with the cheddar. Needless to say after having half of a burger at a place and the sides of fries and deep fried pickles, I was stuffed and ready for a nap. 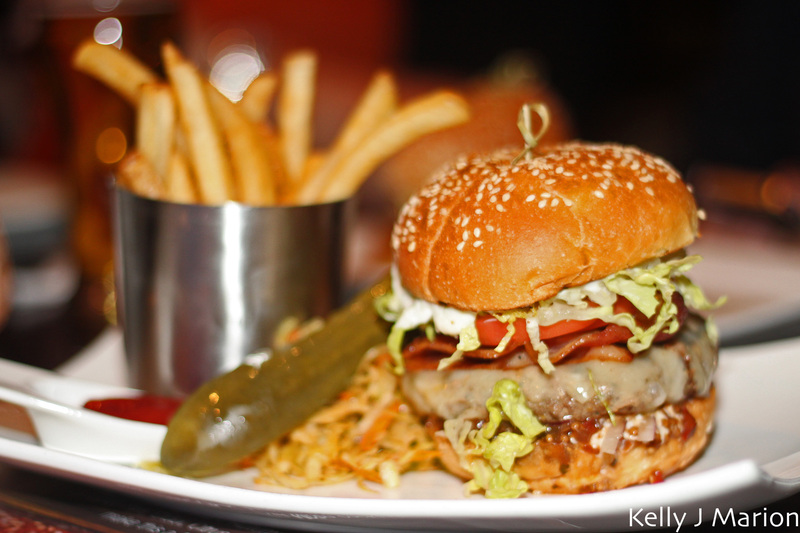 For more photos from my burger tour check out my BEST BURGER CHALLENGE gallery on Flickr. Special burgers not on the regular menu are offered until November 30th but voting takes place until December 3, 2012.